This Is a Legal Transcriber. 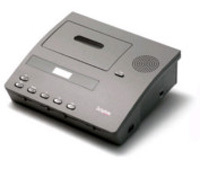 It is designed to transcribe legal tapes that contain a speech timing track. Fully featured for practical transcription. Uses standard / compact cassette tapes. 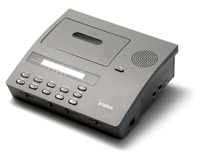 Adjustable playback speed control - Allows the typist to alter playback speed depending on typing speed and ability. · Real time Tape Counter - Helps in finding specific parts of the tape. · Backspace facility - When the play pedal is depressed, playback commences. When the pedal is release, the machine will automatically rewind. The rewind operation is governed by a slide control with a range between 0 - 10 seconds. · Complete with - Headset, Foot pedal and Power supply.